Realism, or Realist paintings can be described concisely as art that has at its main concern the representation of fact or reality and rejection of paintings that are regarded as visionary or romantic [Honour, H and Fleming, J. 2001]. The word Real means not artificial or illusory, so Realism, or a Realist painter would be a person who attempts, in their art, to present which is genuine and authentic. In a historical context this meant that a Realist would be reacting against Iconic art, Ideal or Romantic art. Realism therefore can be regarded as a representation of the real, the current and the happening (the contemporary); and in turn as a reaction against the illusionary, the unreal and the iconic [Gombrich: 1972]. Courbet said that ‘painting is an essentially concrete art and can only consist of the representation of real and existing things’ he went onto say ‘an object which is abstract, not visible, non-existent, is not within the realm of [realist] panting’ [Cited in Cavendish N.D: 619] and here we can tap into the manifesto of Realist painting. So what would the generic definition of Realist paintings be? We would look for a naturalistic representation of the subject in hand, the human body in its unformatted reality for example. We would also look for the unromantic representation of contemporary life, the un-idealisation of subject matter and the loss, or reaction against the symbolistic. The first of Courbet’s paintings I wish to look at is his early work The Hammock (1844). 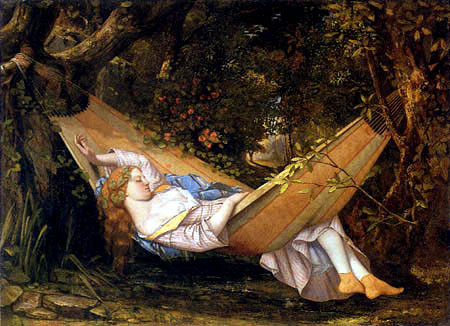 The Hammock is a painting that owes a lot to the paintings that Courbet would have seen at the Louvre, and to the Neo-Classicists that were prevalent at the time [Cavendish: 1985: 611]. The unimposing tones and lines that mark the painting present the scene to be classical and pastoral. The painting doesn’t fit within the conventions of Realism, yet it does show Courbet’s progression. Courbet subverts the ideal nature of the classical model by giving her an ungraceful double chin; though not Realist the painting shows a hint of what Courbet was to continue with. In 1849 Courbet painted The Stonebreakers, this shocked the Salon with its harsh, direct look at the life of peasant life. Courbet employed ‘coarse paints, often mixed with sand’ [Cavendish: 1985: 618] and used Bitumen instead of more traditional black paints. This created a rough, dark and intense canvas that was the antithesis of the smooth, finished paintings preferred by the Salon. Here we find Courbet at his most blunt, not only with his use of paint but also with the subject matter. The stonebreakers have ragged clothes, patched together, the total opposite of the accepted pastoral image of the peasant that the Salon demanded. Here we are presented with a representation of concrete and real things, an un-romantic vision of contemporary life of France in the 1800’s. The toil of the stonebreakers is presented without romanticising their work either, they are not seen to be building anything in particular and the lack of visible goal only reinforces their pointless and futile activity. Courbet said that ‘in this job, you begin like the one and end like the other.’ [Cited in Cavendish: 1985: 618] from this attitude it can be inferred that The Stonebreakers was a work that was meant to shock the Salon, and indeed the French Middle class by portraying the realities of contemporary life and the reality of social inequality within France. Courbet continued his look at contemporary life with the Burial At Ornans (1849-1850). The painting is on a grand scale, approximately 124” x 263” a size normally left to historic or religious paintings. Courbet included real people from the town of Ornans. This caused an upset within the Paris Salon community not only with its grand nature but with its direct representation of the working class of Ornans. Courbet continued his tradition of painting what he knew, or saw with the Burial at Ornans, this paintings contains Courbet’s family, friends, local dignitaries and country people all in traditional catholic dress and again, like with The Stonebreakers, Courbet by committing this normal and contemporary scene to paint challenges the ideals of the Salon and French Middle classes. The outcry was that Courbet’s Burial at Ornans glorified vulgarity [Cavendish: 1985]. We can see Burial at Ornans is a reaction directly against the sensibilities and formalities of Neo-classicism and Romantic art. Instead of using lofty, historical or religious matter he uses the plain, bleak realities of contemporary town life, he presents the townsfolk in a dark un-pastoral way and shows the wrinkles on the mourners’ faces. Courbet’s influence could be seen as ranging from the Dutch portrait painters of the seventeenth century to Caravaggio. Burial at Ornans is very much within the normal conventions of the Realist painting, though he does hint at the symbolic. To the right of the grave opening and bellow the two villagers dressed in Jacobin attire from the revolution of 1793, is a faintly painted skull. This could represent the failure of the revolution in 1793 or even the failure of the 1848 revolutions around Europe. A further inclusion of the symbolic is the appearance of Courbet’s grandfather Jean-Antoine Oudor on the far left. The painting is commonly seen as the burial of his grandfather, if true, then how could Courbet be truly representing what he saw. This inclusion of the imaginary continues to appear in his work and hints that Courbet’s work maybe more Naturalistic in style, then extremely realist. The next Painting I wish to look at, and the final piece, is The Painter’s Studio: A Real Allegory Summing up Seven Years of My Artistic and Moral Life (1855). This is Courbet’s largest and grandest of all of his paintings but it is also his least Realist and most symbolic. The painting centres around Courbet painting in the middle in his studio, surrounded by figures on his left and right. The figures on the left represent all of the people Courbet said ‘lived on death’ [Cited in Cavendish: 1985: 627]. The figures on the right are said to represent those who support him or agree with his ideas. The figures on the left are said to include all the supporters of Napoleon III and the French Emperor as well. Napoleon III is portrayed as the Poacher; Courbet portrayed him as such as he thought that Napoleon III had taken possession of the presidency purposely as a route to imperial power. Several revolutionary groups of Europe are portrayed as well on the left side, the Hungarian freedom fighters as the farm labourer, the Italian freedom fighter Garibaldi as the huntsman and the Russian socialists as the Labourer; all groups that Courbet felt were supported by Napoleon III or were in opposition to his beliefs. Here we can evidently see that Courbet is relying heavily on the symbolic, he is not producing the matter of fact, the real; Courbet is using the allusionary and the symbolistic. This painting isn’t realist at all, it doesn’t rely solely on the ‘real’ as its influence; it is more of a visual manifesto for Courbet’s opinions and political beliefs. As with the hinted at symbolism in The Burial At Ornans Courbet had used the allusionary and illusionary to portray a deeper and more profound point. Courbet set out to portray the real and the existing. Courbet achieved both these aims at times; the early work of The Stonebreakers achieved a perfect balance of both contemporary life and social message. He achieved the wish of portraying the unpolished truth of contemporary life without relying on the symbolic. As I have shown he soon moved away from this, this could be that he found it constraining to solely rely on the ‘Real’ and included symbolic messages in an attempt to explore and expose the inequalities of the world he saw around him. So as Courbet continued to paint he moved away from a strict Realism to a Naturalistic Realism; Naturalistic as he painted that which he experienced and saw around him and his paintings were confined to contemporary settings. So to conclude; Courbet’s work can’t be termed as fully Realist, although he relied on the contemporary and the real, Courbet still ended up using the visionary and the illusionary and in turn that makes him Socially Realist. Therefore Courbet portrays contemporary life in a Socially Realist manner, i.e. contemporary setting, naturalistic colours, forms and dress, and in turn his artwork is not confined by the exclusion of the visionary. So Courbet’s work can be seen as Realist in the manner that he presents contemporary political/social life in a real way, rather than Realist in the sense that he presents everything as it exists without the symbolic or illusionary. The jump cut is an elliptical editing technique which foregrounds the form and constructed nature of cinema. A jump cut is where two successive shots contain an overt break in spatial or temporal continuity. Shot (1) is someone with a beer on a table, shot (2) is the same person lifting the beer and shot (3) the person drinking the beer. Traditionally in the continuity editing system we would see the order 1-2-3 in a simple representation of cause and effect. The jump cut removes shot (2) ensuring a jerky and overt instance of loss in aesthetic continuity. The jump cut is like a skip in the playing of a record or CD; an overt loss of continuity. represents a significant divergence from the continuity editing system, The basic purpose of the continuity editing system is to establish a smooth continuous flow from shot to shot. (1.) The graphic, rhythmic, spatial and temporal relationship is edited so as to look smooth and uninterrupted. The movement from shot to shot is edited so that at all times an aspect of a shot, such as ’shapes, colours, tones of light or dark, or the direction or speed of movement’ is graphically matched to its corresponding shot, thereby ensuring a sense of aesthetic continuity. (2.) In A Bout de Souffle Godard uses the jump shot to create a sense of anxiety and dislocation. In a scene where Michel is explaining the physical aspects of Patricia he loves the camera jumps from shot to shot. The viewer becomes dislocated, unable to grasp the scene’s location: Godard is using the jump shot to replicate the character’s sense of isolation. Both Patricia and Michel are isolated from the culture they belong to, Michel is a criminal and Patricia is in a foreign county, and they attempt to find friendship in each others company. This attempt is futile because Godard refuses to use the shot-reverse-shot technique which would signify their connection; the jump shot ensures that both Michel and Patricia remain isolated individuals even when in each others company. The form of the jump shot ensures the characters in A Bout de Souffle remain isolated individuals without any hope of deep meaningful connection. This sense of isolation is repeated in the scene where Patricia and Michel making love, yet they still struggle to connect and ultimately remain isolated. Although they both constantly talk to each other they barely look at each other. Patricia looks past Michel as he talks to her, the scene then jumps to Michel alone looking into his reflection. This signifies the failure in communication that typifies Michel and Patricia’s relationship. (1.) M, Pramaggiore & T, Wallis. (ed), Film a Critical Introduction, p. 356. (2.) David Bordwell & Kristin Thompson, Film Art: An Introduction, Third Edition, London: McGraw-Hill Publishing, (1990) p. 218.